Humphreys County is a county located in the U.S. state of Tennessee. As of the 2010 census, the population was 18,538. Its county seat is Waverly. Humphreys County was established in 1809 from parts of Stewart County, and named for Judge (and future Congressman) Parry Wayne Humphreys. The county seat was initially located at Reynoldsburg, near the mouth of Dry Creek. When the western half of the county was split off to form Benton County in 1835, the seat was moved to the more centrally located Waverly. During the Civil War, the Battle of Johnsonville was fought in the western half of the county. The remnants of the battle site are the focus of Johnsonville State Historic Park, though much of the battlefield has been submerged by dams on the Tennessee River. According to the U.S. Census Bureau, the county has a total area of 557 square miles (1,440 km2), of which 531 square miles (1,380 km2) is land and 26 square miles (67 km2) (4.6%) is water. As of the census of 2000, there were 17,929 people, 7,238 households, and 5,146 families residing in the county. The population density was 33.7 people per square mile (13/km²). There were 8,482 housing units at an average density of 15.9 per square mile (6.1/km²). The racial makeup of the county was 95.52% White, 2.94% Black or African American, 0.27% Native American, 0.26% Asian, 0.01% Pacific Islander, 0.16% from other races, and 0.85% from two or more races. 0.83% of the population were Hispanic or Latino of any race. There were 7,238 households out of which 30.30% had children under the age of 18 living with them, 57.30% were married couples living together, 10.20% had a female householder with no husband present, and 28.90% were non-families. 25.00% of all households were made up of individuals and 10.60% had someone living alone who was 65 years of age or older. The average household size was 2.44 and the average family size was 2.90. 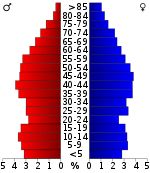 In the county, the population was spread out with 23.90% under the age of 18, 7.60% from 18 to 24, 27.50% from 25 to 44, 26.20% from 45 to 64, and 14.80% who were 65 years of age or older. The median age was 39 years. For every 100 females there were 96.80 males. For every 100 females age 18 and over, there were 93.10 males. The median income for a household in the county was $35,786, and the median income for a family was $42,129. Males had a median income of $31,657 versus $20,736 for females. The per capita income for the county was $17,757. About 7.60% of families and 10.80% of the population were below the poverty line, including 12.50% of those under age 18 and 13.70% of those age 65 or over. ^ "About Tennessee: Origins of Tennessee County Names" (PDF). Tennessee Blue Book. State of Tennessee. 2011–2012. p. 599. Retrieved October 17, 2013. ^ Binkley, Trina L. (January 1, 2010). "Humphreys County". Tennessee Encyclopedia of History and Culture. Retrieved October 17, 2013. ^ Gannett, Henry (1905). The Origin of Certain Place Names in the United States. Geological Survey Bulletin, no. 258 (2nd ed.). Washington, D.C.: Government Printing Office. p. 163. OCLC 1156805. ^ "Johnsonville State Historic Park". Tennessee State Parks. Retrieved October 17, 2013. ^ Based on 2000 census data. 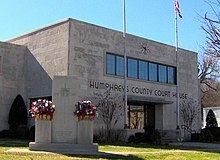 Wikimedia Commons has media related to Humphreys County, Tennessee.